Local Australian artist, Glenn Farquhar creates bespoke large scale artworks that are impressive and surprisingly affordable. 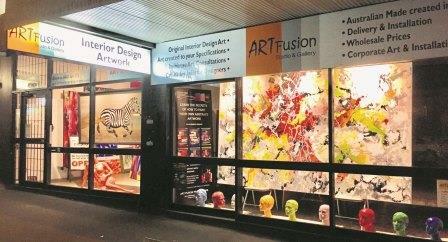 His art studio and gallery in Annandale has been creating unique interior design artwork for Sydney homes and commercial spaces for 15 years. Glenn has an holistic, collaborative approach, encouraging clients to share their ideas, discuss preferences and bring photos of the area in which the artwork will hang. Together, they brainstorm concepts until both agree on the size, shape, colours and style that will perfectly complement not only the aesthetic of the space the artwork will occupy, but the personality of the client. For an even more personalised input, clients can opt to paint the work side by side with Glenn, who will guide them through each step, allowing them to make the actual strokes so that they can legitimately claim the painting as their own work. Private instruction is available to individuals or couples for works up to 200cm x 100cm. What a wonderful way to put your personal imprint on your home. Art fusion also has a large range of ready made contemporary artworks in stock, and they specialise in creating extra-large artworks for corporate offices and interior designers.